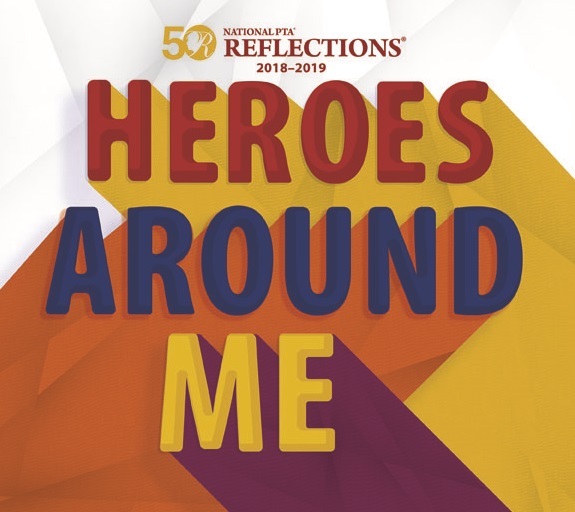 Reflections is a National PTA Arts Contest that provides students opportunities to express themselves creatively by creating original works of art inspired by a pre‐selected theme. It’s easy to participate! Think of the theme HEROES AROUND ME, prepare an entry in one or more of the 6 categories, submit your entry or entries on or by December 3rd. There will be a drop box in the JES lobby from November 19 to December 3. Please be sure to attach the local student entry form. Winners are selected at School, Baltimore County, State, and National Levels. Review the Category Rules for the category in which you would like to enter. Please read and follow the Official Participation Rules and Category rules carefully. ENTRIES ARE DUE: In the JES lobby on or before December 3rd. Please remember to sign and attach a completed entry form including the artist statement to each submission. If you have any questions or need assistance, please contact Mary Beth Railey or Dawn Williamson at jesreflections@gmail.com.